The Multicare LE Acuity Adaptable Hospital Bed offers key features designed for use in multiple care settings. The Multicare LE hospital bed is designed to meet the needs of a higher acuity patient in a variety of care settings. The Multicare LE is versatile enough to be used in higher acuity medical-surgical units, step-down units, transitional care units or community hospital ICUs. Multicare LE offers key features of a higher acuity ICU bed, but at an affordable price. The open architecture of LINET bed frames also allows you the flexibility to choose the support surface that best meets your wound care needs. LINET’s proprietary platform provides a full-body lateral tilt for the patient with a frame based tilt up to a maximum of 15 degrees. This makes it easier to turn the patient every two hours, as well as to perform skin assessments, dressing changes, and linen changes. As an added benefit, with the frame doing the majority of the work in turning the patient, less effort needs to be applied by the caregiver, saving time and minimizing dangerous forces that could lead to back pain and injury. Superior siderails, multi-zone bed exit alarm, and intelligent braking features help ensure the patient is protected from potential falls. The minimum gap siderail design also helps reduce the risk of patient entrapment. The Multicare LE reduces pressure and shear through its proprietary Ergoframe® design. Inspired by wound care experts, this feature significantly aids in the prevention of pressure injury by increasing envelopment capacity in the sacral area as the bed articulates. Integrated scale, Mobi-Lift® built-in sit-to-stand lift, automatic fifth wheel, lateral tilt, and hands-free foot controls are standard features designed for ease of caregiver use while minimizing the physical strain encountered by the nursing staff when providing care. Unique, platform-based turn up to 15 degrees. Helps reduce patient migration and minimize pressure in the sacral area as the bed articulates. 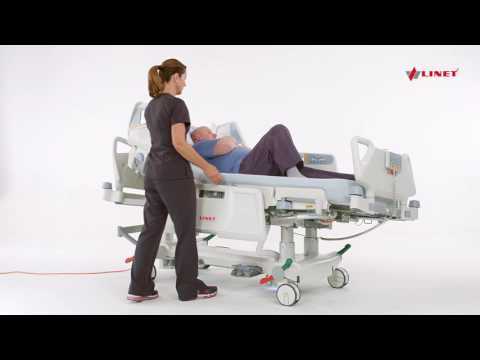 Built-in sit-to-stand device allows for active participation from the patient during mobilization.